Mickey Mouse Clubhouse: Super Adventure! Is Now on DVD! 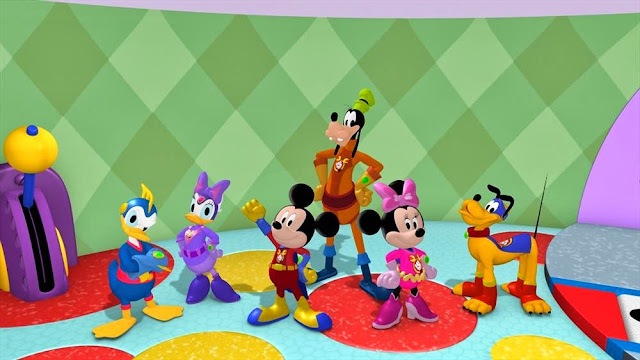 If you have kids ages 2- to 6-years old, they'll love to watch Mickey Mouse Clubhouse: Super Adventure! now on DVD from our friends Disney Junior! 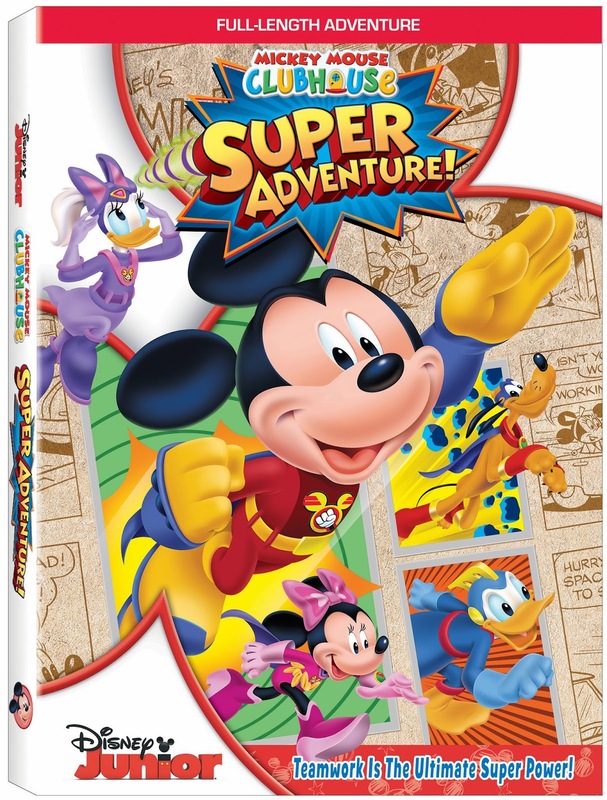 Watch Super Mickey, Wonder Minnie, Super-Power Pup, Super Goof, Dynamo Duck and Upsy-Daisy to the rescue in this full-length adventure! There's even Power-Pants Pete, who starts shrinking everything he sees down to teensy-weensy size! And to save the day, you can count on Professor Von Drake to transform the Clubhouse Gang into superheroes with awesome powers! The Mickey Mouse Clubhouse Gang Transformed Into Superheroes! Oh-oh: Power-Pants Pete is in cahoots with Megamort, who's behind the shrinky-dinky caper! Can our heroes outwit Pete and Megamort? Count on them to work together, get help from YOU, and find the right Mouseketools! Join in for lots of action, surprises and almost 2 hours of excitement--as well as 3 additional episodes--which celebrates the unrelenting power of friendship and teamwork! My kids absolutely love when they dress up the Mickey Mouse Clubhouse gang as superheroes! It's pretty awesome! And it's awesome when the kids join together to call "Oh, Toodles" to make the Mouseketools appear! WIN Mickey Mouse Clubhouse: Super Adventure! on DVD and a Mickey Mouse Clubhouse prize pack from SnyMed.com! Prize pack will include: Mickey Mouse Clubhouse: Super Adventure DVD, Mickey Mouse Clubhouse Ornament, Mickey Mouse Santa Hat, Mickey Mouse Clubhouse Night Light, Mickey Mouse Clubhouse Coloring Book, Mickey Mouse Clubhouse Crayons and Mickey Mouse Clubhouse Temporary Tattoos. 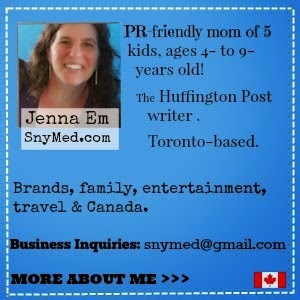 Contest ends December 11th, 2013 at 12:00 noon EST so check your e-mails and is open to CANADA & USA. Winner: although we will try our best to ship before Christmas, it is not guaranteed. Thank you for your understanding. 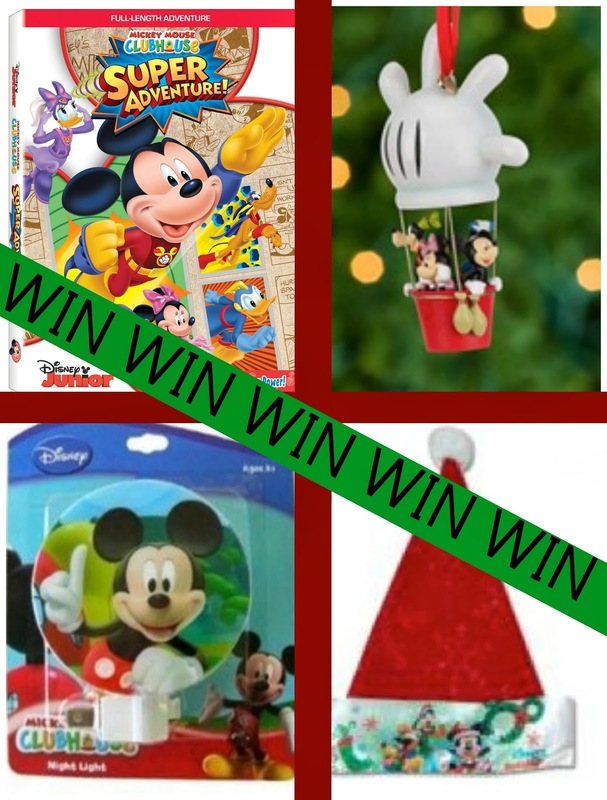 WIN This Mickey Mouse Clubhouse Prize Pack...and More! Leave a COMMENT below stating your favourite Walt Disney character, or who you'd like to WIN this prize for. Then, use the entry form below to enter the contest. GOOD LUCK! Minnie Mouse is my daughter's favorite Disney character. I would love to win this for her! My favourite character is Goofy. I'd like to win this for my cousin's little girl. Mickey is my favourite, my two boys would love this prize. Mickey is my favourite, my boys would love this prize!! Winnie The Pooh is my favorite! oops forgot to say I would like to win it for my nephew! Mickey is still my favorite ! Eeyore is my absolute favourite! I love Goofy. He's the greatest. Goofy is def my fave character! I've always loved Pluto. I'd give this dvd to my niece (she's 2) if I won. I like Goofy & I'd give this to my grandkids if I won. Goofy is my favourite :) Would love to win for my sons! Mickey Mouse is my fav. I love all winnie the pooh. My nephew would love this gift. My favorit Disney character is MICKEY MOUSE....I have a little girl who would love this. I would love to win this for my littlest guy, he loves Mickey Mouse! Woody is one of my favourite characters. Mickey Mouse is my favorite! And I want to win for some little ones I know. I would share with kids i watch. They love Micky. I'd love to win this for my daughters!